If you think that you can't embroider items that you can't get into a hoop, or hold with self-adhesive stabilizer, think again. 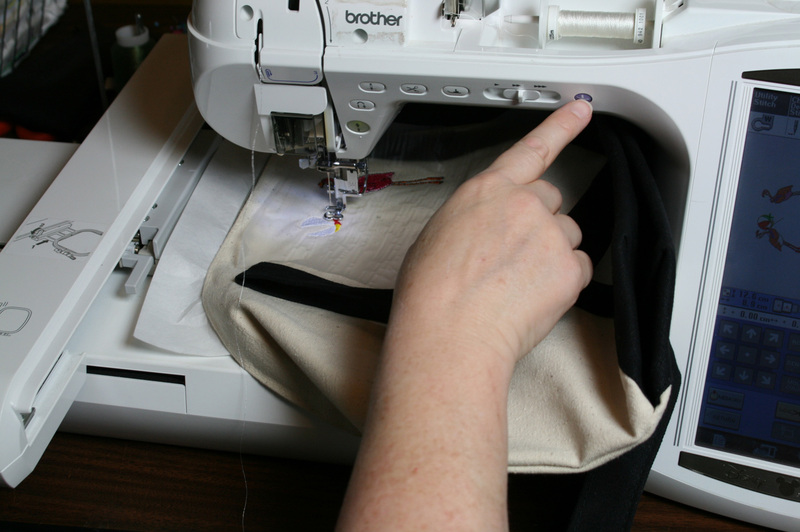 There's another method that will let you hold big, bulky items under the embroidery needle. I embroidered this tote bag on my single-needle home embroidery machine and it came out great - even with the relatively complex design and lots of outlines. Here's how I do these kinds of projects, keeping them held under the needle. I don't walk away from the machine using this method, but it is more secure than using self-adhesive tape for heavy or bulky items. First, hoop a piece of heavy cut-away stabilizer in a hoop size that is generously larger than the embroidery size. 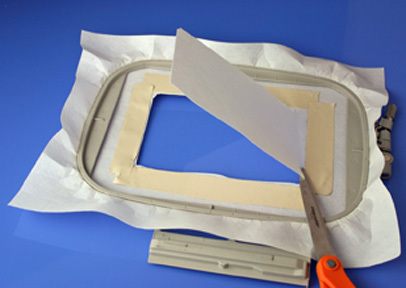 You will need room along the sides of the hoop to apply double-faced tape as shown here. The tape is what's special. You will need to get super-sticky carpet tape, or Google the brands TUCK and BROn. Cut away the stabilizer just inside the tape as shown here. Attach the item securely to the tape by finger-pressing it along all edges of the tape. You may find it easiest to turn the item in a different direction, so be sure to remember to rotate. Slide a bit of stabilizer beneath the item to support the embroidery area. Then just stick by the machine until it's finishes. It's a quick and easy solution to those hard-to-hold items! I don't understand why you would cut away the stablizer and then float a piece. What would be the difference if didn't cut it away. It would appear the sticky back stabilizer with the addition of the double face carpet tape is to create an in-the-hoop set-up without using sticky back on the actual project. Sticky carpet tape can be more aggressive that the stabilizer. 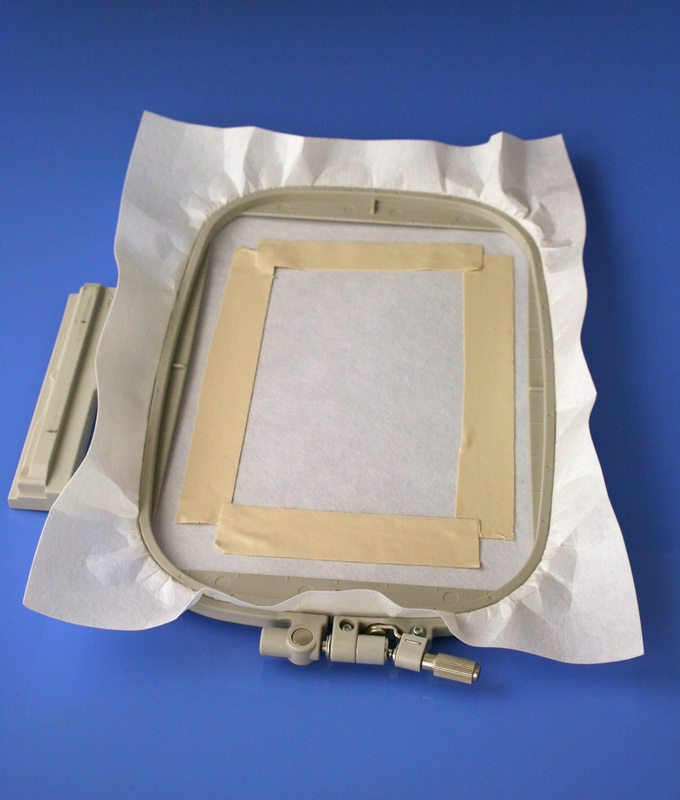 When you use a sticky back stabilizer or spray adhesive, the heat of the needle can cause gumming and thread breakage. When I use sticky stabilizer, I use Titanium coated embroidery needles. They do not heat up and there is no gumming and thread breakage. What a great idea. I have some bags to do so I will be sure to try it. I'm confused as to why you cut out the heavy cut-away stabilizer too. They were hooping heavy cut away stabilizer, not sticky stabilizer as one poster thought- this adds to the stability to prevent any pulling from inside the hoop, then cutting away the stabilizer so that there would be no remaining heavy weight stabilizer showing around the stitches on the inside of the bag. If you had a pocket you were adding to the inside of the tote, then stabilizer showing may not be a concern for you. 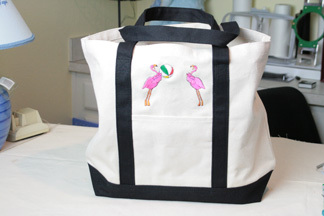 You would want the cut out portion to be just slightly bigger than the design size but in a hoop large enough to manage having the double sided carpet tape around the opening as well as the room to manage the rest of the tote bag being worked on. They then floated a piece of stabilizer- likely tear away, as they did not say, but either a tear away or an iron away, as those would be the ideal, as you are just wanting the stitches supported, as the little flamingos may have had stitches smaller than the weave of the canvas cloth, so the light weight floating stabilizer underneath would just be supporting those stitches that did not have the support of the canvas material, so a single lightweight layer, that would be removed once the stitching was complete and would leave no product remaining, that would have been seen on the inside of the tote bag when in use, just makes a more professional looking project. No sticky or spray would be needed that was a concern of another poster. If a material was being used that did have stretch to it, then the sticky stabilizer would likely have been helpful mounted over the the underside of the cut out so the sticky would hold it to the heavy cutaway and also then help hold the material in place over the cut out section, as well as you would also then need either netting, scrap of recycled grocery bag or another light weight stabilizer to help keep the stitches from sinking into the nap of the fabric. But again the choice of stabilizer would need to be one that would totally be able to be removed once stitching was complete, without distorting the stitches themselves during the removal of the stabilizer. Keeping the hooped stabilizer from moving as well as keeping the material in place, is the most important part of how you hoop your items. You want it tight like a drum, so if the heavy weight stabilizer is still moving, what so ever, I would be sure to wrap the sides of the bottom hoop with elastic tape- like hospitals use to wrap around an IV site, the elastic sticky tape sticks to itself, this helps the stabilizer to not be able to slide as easily between the edges of the inner and outer hoops. Along the sides of the hoop is generally where stabilizer is prone to slipping , more so than at their corners. If there were a great deal of stitches in the designs, then having multiple layers of tear away would help to support the stitches in those types cases- If you use multiple layers then be sure to alternate their directions - north /south, east /west, or criss cross as some stabilizers this will help them to remain taunt and tight rather than becoming loose during high stitch count projects. Hope this helps explain why they may have made the choices they did in this project. I can't see the pictures of what you are doing.